I had 44 boxes of Roth and Allen installed into a 300K condo with only 2 people living here and a little 9lb dog. The floor performs terribly and a rep came out to check out temp / water probems, big dogs/ lots of people living here and found zero of his possible options of why it is scratching so bad. He said it’s the rustic look and performing as it should be?????? It took me 6 months of going to Lowes/ Customer Service phone calls to Roth and Allen to get this guy to come out and tell me this.... DO NOT BUY THIS BRAND! Join in and write your own page! It's easy to do. How? 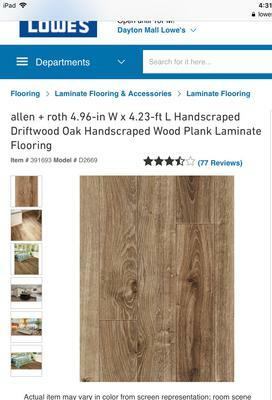 Simply click here to return to Laminate Reviews.